So I am deeply in love with Elder Scrolls Online and I felt after hours of work, I finally managed to make a good looking Khajiit character. It made me realize just how far we've come in video games. During that time, that was the best looking Khajiit around (please for the love of god, don't look up Morrowind Khajiits). NPCs or characters in modern games are so detailed, I feel like people don't appreciate them because we're so used to the advanced graphics. I know that graphics aren't everything, and it isn't mandatory for the game itself to be good. But holy christ, it really does make a big difference having much better looking characters that aren't outdated as hell. Question: Take a look at your current favorite game, and I want you to look at any prequel or previous title to compare the two. If there's no game based off your favorite, just look at the previous games the developer of said game did. Let me know your thoughts, or how you feel about the subject in general. Hmmm, my current favorite game eh? I wont pretend Morrowind graphics hold up against Skyrim, but Morrowind characters, despite their mix-n-match hair/face thing, are more unique. Now I cant tell a wood elf from a high elf, and everyone has the same hair. That said, still better than Daggerfall and Arena. If that is important to you. Personally some of my favorite games are sprite based with a great visual aesthetic. Trying to get back into Dwarf Fortress again, so lets try that one. No previous games, but was inspired by Hack (which turned into Nethack) and Ultima (among others). Though I must admit that I always use tiles, even though I could play with ASCII characters, but tiles are more aesthetically pleasing to me and help me differentiate between stuff quicker. I could do Ultima, but 1983 (IIRC) to 1997 across 10 entries would be a bit much to go dig up screen shots of, and still look pretty janky in 1997. Heroes of Might magic might be an interesting one, but I'm not sure what the latest one is, since Ubisoft started mucking about with the naming. Looking at characters from one of my favorite games and then its prequels? Sure. I'm confused, what were we talking about again? Mega Man joke aside, I can certainly appreciate how far character models have come through the years. More so than characters, I'm often impressed by modern 3D environments as well. In the past a lot of 3D games felt empty to me, just some simple geometry with a skin slapped on it, but as technology advances they are becoming more fleshed out. I feel like there is a shift in art style. The Khajit went from realistic depection of Cat People, to Furry Bait. I notice that. I plug in an old game... a cutscene starts up and I think "wow, that looks pretty dated." And that's it. The second that thought crosses my mind, its gone again, replaced by enjoyment of the game I am playing. Basically I notice graphics... it just doesn't matter compared to EVERYTHING ELSE about a game. It is the least important thing about any game I care to go back to. ...Realistic depiction? I'm sorry, but I must question the suggestion that there can be a meaningfully "realistic depiction" of a wholly fictional race. We don't have any basis for comparison. At best it's pure speculation and a matter of internal justification. I mean I will grant it in very broad strokes like the square-cube law (eg. "A 50-foot tall giant would NOT be able to stand on such thin legs") and other things that would make a design practically implausible, but without such justifications? And in a high fantasy setting no less? It's as nonsensical as comparative realism between the design of centaurs in Guild Wars and centaurs in the Chronicles of Narnia. This is something I was thinking about like two-ish years ago when I finally decided to finish Metal Gear Solid 4 before I would let myself buy MGSV. I think the first game I bought for my PS3 was MGS4 and I remember thinking how detailed the characters were and when I went back to finish it, I restarted (because I forgot how to play and didn't know what the hell was happening) and I was thinking this doesn't look great. Not only that, replaying the Arkham Games and Arkham Knight, I couldn't help but think that the biggest change has been facial capture and mo-cap. It's VERY clear that there's little to no mo-cap in MGS4. When someone from Meryl's squad is waving people to cover, it looks like their arm is broken and in a splint because it just doesn't move right. All the cutscene movement is stiff and unnatural. And when you watch the FF15 movie or play the game, the characters look great, but the camera likes to move behind the head of whoever is talking or cut to a wide shot because there's no facial capture. So, LA Noire might not look great now, but going back to it is less jarring. And same with the Uncharted series. They really stand above their contemporaries from a decade ago now. It strikes me as funny that ESO, or at least the beta when I played it, even has a better character-creation system than Skyrim. In ESO I made a chubby, matronly Khajiit female with silver fur; Skyrim wouldn't let me change body types, so my Argonian light-armor/archer/mace-and-shield scout had the same physique as those greatsword-swinging Nord berserkers. Also, Skyrim's beast races have pencil-thin necks that look like they should snap from a good breeze. DF just looks like a mess with ASCII. That thing with the grass where it will use a bunch of different symbols randomly just epitomizes the lack of clear focus that ASCII requires. It's like, you already have a huge mess of a hundred different rarely used symbols the last thing that's needed is to add redundant symbols for the same object just to add complexity for the sake of it. Nethack works sooo much better with ASCII, better than tiles even I think. There is a clear focus and order to the design. It's pretty easy to tell at a glance what is on screen, where the tiles are a bit muddier. 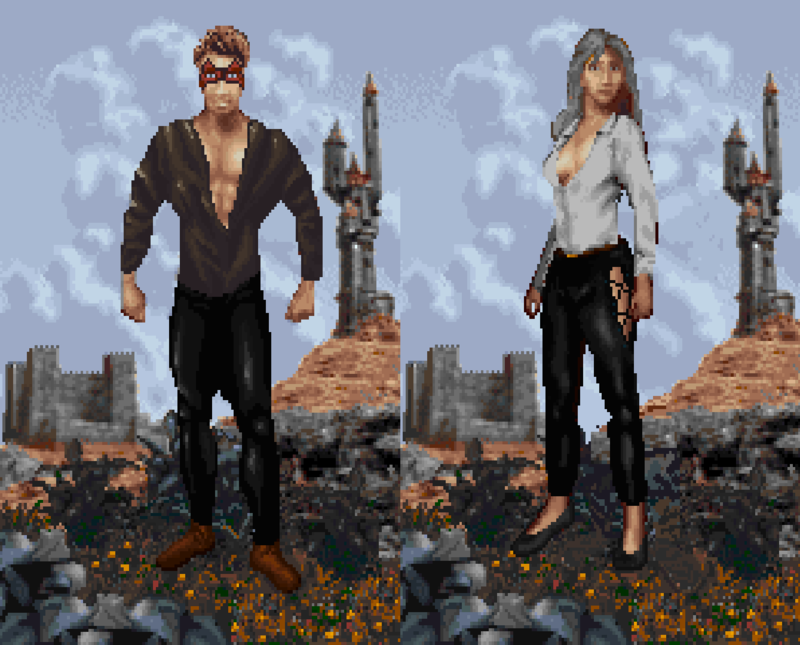 Although I enjoy graphics improvements as much as anyone, I take NPCs with personality over pleasant looking ones any day. 10 years from now, we'll probably be making the same comparison with Elder Scrolls X: Dwarven Domain (or whatever be the latest instance in the series).